Ornamental Mushrooms: The Next Gardening Fad? Up In the Sky… It’s a Black Truffle?? 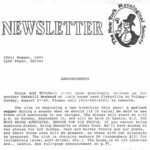 This entry was posted in Newsletters on July 1, 1993 by paul sadowski.